A GREATER FLAMINGO THAT MAY HAVE BEEN BLOWN INTO TEXAS BY HURRICANE ANDREW. 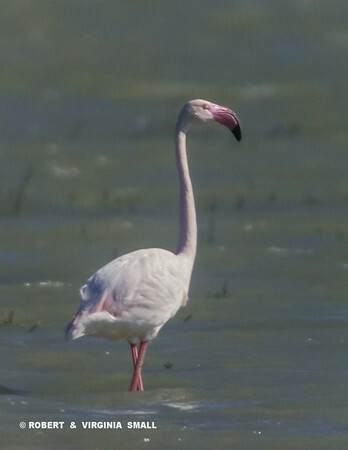 WILDLIFE OFFICERS AT LAGUNA ATASCOSA NWR ON THE TEXAS GULF COAST WERE AWARE THAT A FLAMINGO HAD ARRIVED AT THE REFUGE. FOR QUITE A WHILE IT REMAINED ON THE OUTER REACHES OF THE VAST, SHALLOW LAKES ON THE REFUGE AND THEY HAD NOT BEEN ABLE TO GET AN ID PHOTO TO VERIFY THE SPECIES. THEN, ON THE SAME MORNING THAT WE WERE PHOTOGRAPHING A MELANISTIC ROSEATE SPOONBILL ON ONE SIDE OF ONE OF THE TOUR ROADS, THE WIND CHANGED AND THE FLAMINGO FLEW IN CLOSER TO US ON THE LAKE ON THE OTHER SIDE OF THE ROAD! WHAT A DAY! WE WERE ABLE TO GET A PHOTO AND TO IDENTIFY THIS LOVELY ALL-PINK BIRD AS A GREATER FLAMINGO.